The Isle Where Buffalo RoamIn 1924, a film crew descended on California’s Catalina Island to shoot a silent Western called The Vanishing American. When the filming was finished, the crew members packed up and left. Legend has it, however, that they abandoned several of their extras. The castoffs—14 American bison—took up residence in the arid hills of this rocky island. In the decades that followed, the bison did what bison do: The animals grazed and bred. Each spring a new batch of calves was born. By the late 1980s, some records suggest the herd had swelled to more than 500 animals (pdf). On this small island where no bison had ever lived before, these unlikely ungulates thrived. The buffalo’s success, however, came at the expense of Catalina’s vegetation. The island, covering just 75 square miles, is home to more than 400 native plants, several of which are found nowhere else in the world. The free-roaming bison’s voracious appetite, sharp hooves, and penchant for scuffing out wallows—dusty depressions where the animals roll—took a toll on the grasslands. 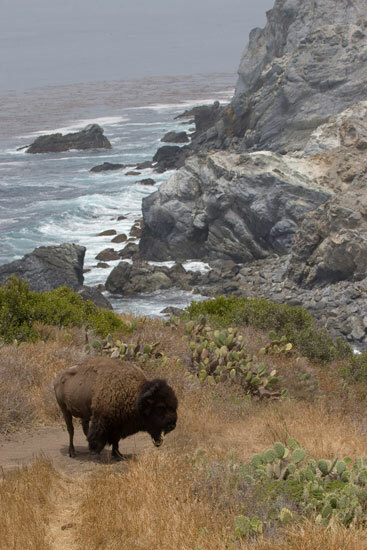 The bison and their shaggy coats also helped spread the seeds of non-native plants.Comment: I saw these buffalo when I visited Catalina as a boy. It seems typical of Americans to do something like this without thinking about the consequences. Move the buffalo, kill the buffalo; move the Indians, kill the Indians. Who cares what happens next? That's somebody else's problem. For more on the buffalo, see White Buffalo Hunt in Texas and Slaughtering Buffalo = Genocide.